“The Security Council deplores the loss of life and injuries and expresses its deep sympathy and condolences to the victims and their families and to the people and Government of the Republic of Korea, and calls for appropriate and peaceful measures to be taken against those responsible for the incident aimed at the peaceful settlement of the issue in accordance with the United Nations Charter and all other relevant provisions of international law. “In view of the findings of the Joint Civilian-Military Investigation Group led by the Republic of Korea with the participation of five nations, which concluded that the Democratic People’s Republic of Korea was responsible for sinking the Cheonan, the Security Council expresses its deep concern. The statement goes on to praise South Korea’s restraint and to encourage settlement of the dispute by pacific means. Translation of the UN Statement: Everyone on earth knows that North Korea is guilty as hell, and that South Korea was the victim of an unprovoked missile attack. But, because China and Russia do not want any possibility of kinetic conflict breaking out, the only action the Security Council had available was to release a toothless condemnation that, although it acknowledges the truth in a circumspect way, precludes any possibility of more overt Security Council involvement. 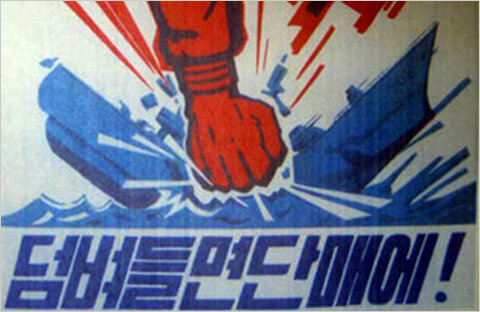 As seen by North Korea’s recent propaganda posters, North Korea is not particularly reluctant to acknowledge, in an equally circumspect fashion, that of course it blew up the Cheonan, and it is not afraid to do it again. Pyongyang, July 13 (KCNA) — The U.S. and the south Korean puppet authorities tried to save their lost faces even a bit, uttering that they feel disappointment with the presidential statement of the UN Security Council concerning the “Cheonan” case but there was what they called “success” at least. World media, however, consider the presidential statement as a total fiasco for them. No wonder, media put it that the south Korean authorities’ original plan to wrest “apology and compensation” from the DPRK by prodding the UNSC into adopting a “resolution” of legal binding force went up in smoke, terming the presidential statement an absurd and toothless one. A particular mention should be made of the fact that media are jeering at the U.S. and south Korea, saying: The fact that the presidential statement took note of the DPRK’s stand that it has nothing to do with the case of “Cheonan’s” sinking now that the “chief culprit” of the case has not yet been probed means, in the final analysis, that the UNSC does not view the case as “something done by north Korea”, and the U.S. and south Korea raised a hue and cry over the case but it ended in the publication of a very ambiguous presidential statement that seems to defend north Korea. This is a natural outcome based on the objective reality in which the international community terms the U.S. and the south Korean authorities’ “Cheonan” diplomacy a fiasco. A scrutiny into the presidential statement proved that the DPRK was right when it asserted that the case is an issue to be settled between the north and the south, not an issue to be referred to the UNSC in view of its nature. By nature the UNSC has to perform the function of handling any incident posing “threat to international peace and stability” and finding out its culprit and “punishing” him. However, the presidential statement not only took a deformed attitude of condemning the recent case itself without singling out the author of it but also called upon the parties concerned to settle the case peacefully through their direct dialogue after considering it as a regional affair. This amounted to the UNSC’s affirmation of the DPRK’s stand that the “Cheonan” case is not a matter to be dealt with at the UN forum as asserted by the United States and the south Korean authorities, but a matter to be settled by the north and the south of Korea. Such being the case, the U.S. and the south Korean authorities are misinterpreting the presidential statement in favor of them, adding something to it as they please in a bid to save their face even a bit. But such behavior will only reveal how poor their position is. Every sin brings its punishment with it and one bereft of any reason would talk much. Though the U.S. and the south Korean authorities are talking a lot like a thief afraid of his own shadow, they can neither cover up the truth behind the “Cheonan” case nor hide up their despicable true colors. In keeping with the presidential statement saying that “the Security Council encourages the settlement of outstanding issues on the Korean Peninsula by peaceful means to resume direct dialogue and negotiation through appropriate channels,” the DPRK will do its utmost to probe the truth about the case to the last and achieve peace, stability and denuclearization of the peninsula. The failure to capitalize “north” and “south” is deliberate, owing to the DPRK’s failure to acknowledge the existence of two countries. Parts of it read like it was lifted from a particularly obscure fortune cookie: “Every sin brings its punishment with it and one bereft of any reason would talk much”; “talking a lot like a thief afraid of his own shadow”; “This is a natural outcome based on the objective reality”. Although it gets points for colorful imagery, North Korea comes across sounding far too much like Baghdad Bob for the statement to be taken seriously by anyone. It is clear that North Korea could stand to learn a thing or two about diplomatic spin from the United States. Editor’s Note: Yesterday, I said I’d write about the hypothetical example of aliens landing in Somalia. I was thinking I’d talk about the extremes — the differences in how international law would treat aliens in a failed state vs. aliens in the territory of a permanent member of the Security Council. But I’ve changed my mind; using Somalia makes the question too easy, as the lack of government there makes it exceedingly unlikely that other states would bother to respect Somalia’s territorial integrity in the event of an alien invasion. Instead, I’m going to borrow from District 9 and use South Africa as a hypothetical. In a scenario similar to the premise of District 9, a lone alien spaceship lands in South Africa. The aliens’ behavior and appearance give no indication that they intend any harm to humanity, but the vast majority of States are unwilling to accept that at face value. South Africa, however, feels that it has the situation under control, and wants to treat with the aliens without foreign interference. The government of South Africa refuses to allow any other nations to visit the aliens or become involved in the situation, and only gives cursory answers to questions about the extraterrestrial visitors. Resolution through diplomacy does not appear likely, so if other states want to speak to, examine, or blow up the aliens, they can only do so by the use of force against the territorial integrity and political independence of South Africa — something which is absolutely prohibited under international law. Do other States, then, have any available options under international law besides engaging in illegal acts of war against South Africa? If both these conditions are not present, then international law comes back into play.